The NOVA brand delivers high-quality instruction and other language services to those who wish to improve their communicative proficiency in foreign languages. Students of a wide range of ages and ability levels, from complete beginner to very advanced, can choose to take small group or private lessons face-to-face in one of the many NOVA school branches throughout Japan, over a video-conferencing system or online from the comfort of their own homes, or a combination. In addition to conversation skills-based lessons, test preparation courses are offered to students studying for specific English tests such as TOEIC or TOEFL. Also popular is our range of NOVA Plus courses. Some of these courses focus on specific skills (such as grammar, vocabulary, pronunciation, etc.,) and some are geared towards specific purposes (such as business or travel). As an additional supplement to classroom-style lessons, most branches also offer a conversation practice style of lesson known as Voice. Voice provides students with an opportunity to practice what they have learned in their lessons in a supervised, but self-directed forum to help them become more accustomed to and confident communicating naturally in a second language. For younger learners, we offer NOVA Junior, a program developed specifically for children aged 3 to 12. Through our NOVA Junior program, students learn to read, write and communicate confidently in English in a fun and supportive environment. The program is designed to complement what they learn in school and prepare them for future studies. For students who are interested in languages other than English, French, German, Chinese and Korean face-to-face lessons are also taught in selected branches across Japan. 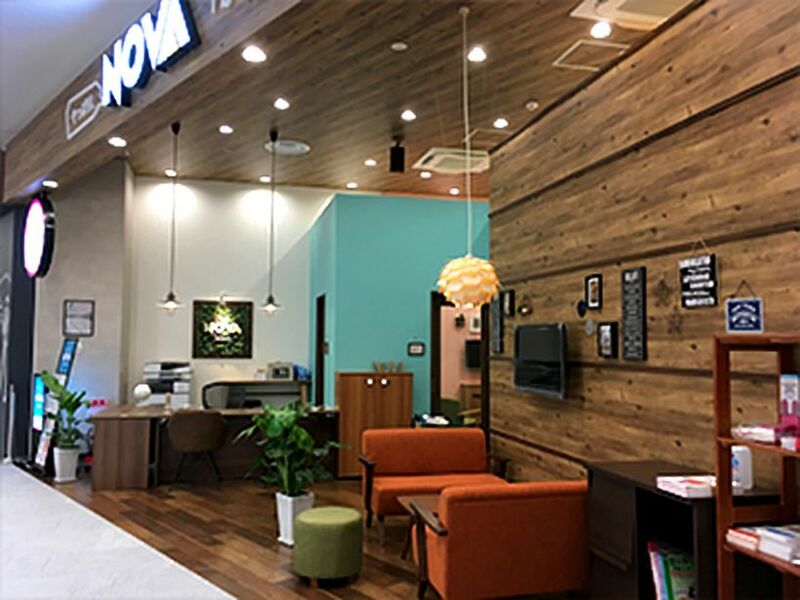 Lessons in all nine languages offered by NOVA (including English) are available through the Multimedia Center, based in Osaka. The Multimedia Center offers both small group and private lessons, both online and through a video conferencing system. The curriculum mirrors the classroom curriculum with the added appeal of extra audio and visuals. 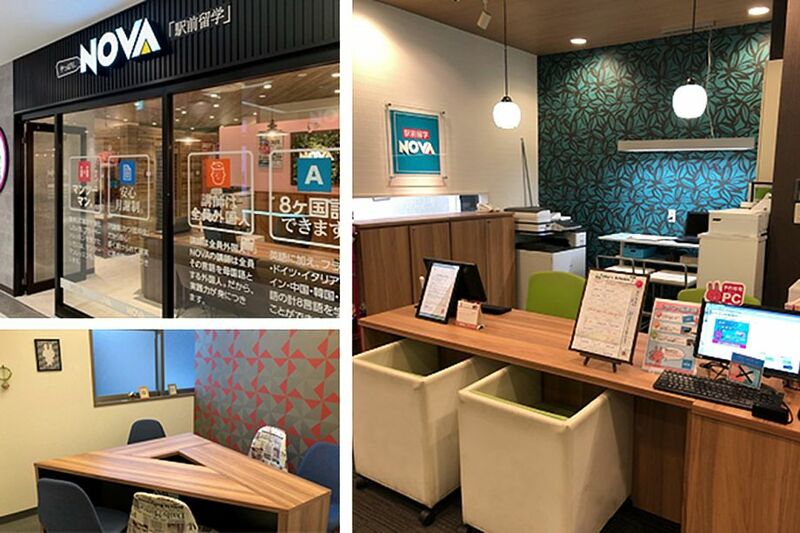 NOVA students on free-booking plans can take lessons at any NOVA branch within Japan, whenever seats are available in lessons of their ability level(s). NOVA branch schools are generally open seven days a week. On regular weekdays, schools are typically open from around midday until 9:30 p.m., and on weekends and national holidays from 10:00 a.m. until 6:30 p.m. Larger schools may be open from 10:00 a.m. through to 10:20 p.m. every day of the week. The Multimedia Center offers lessons up to 24 hours a day (depending on the language). This provides students who want to take lessons outside of regular branch opening hours, and also those who live in remote areas, extra scheduling options. Group class sizes are limited to a maximum of four students for adult classes and eight for NOVA Junior classes. All instructors are native speakers of the respective language that they teach. Lessons are taught in the target language only in order to be fully immersive. There are many opportunities throughout the lesson to practice and apply the language being studied. An individual, electronic study record is maintained for each student and used to identify, monitor, and cater to individual learning needs. Study systems are flexible and convenient to use; students are able to combine different courses, languages and study locations. All NOVA instructors are native speakers of the language that they teach. Some begin their NOVA careers with previous experience as educators and some with no prior teaching experience. Regardless, every instructor completes a comprehensive training program before they start teaching for NOVA. The program equips them with everything they need to be able to teach high quality lessons and provide excellent customer service. All NOVA instructors are committed to meeting and exceeding student expectations and supporting student progress towards the achievement of their goals.